Joie de V: Can I Borrow Your Notes? Today was just plain nice. It all started when Miles only woke up once last night, and kept going when he napped for nearly three hours this morning. I was beyond excited that he was sleeping so long, but I was ready to head out to spend the afternoon with my friends Whitney and Becky and their kids. We had so much fun drinking way too much caffeine, eating doughnuts, and laughing about all sorts of things! I really enjoy connecting with friends, but especially now when we can relate to each other and compare notes as mamas. 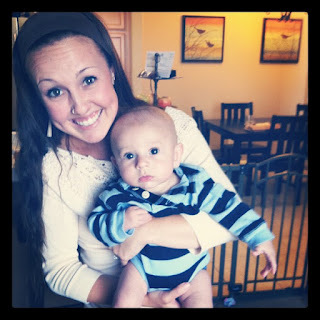 Speaking of comparing notes, I have been reading and researching how moms introduce and set the stage for a healthy diet once their babies start solids. Miles isn't there yet, but he will be shortly, and I would be lying if I said I didn't have any anxiety about it. I read the book French Kids Eat Everything and it really got me thinking about how the way food is introduced to a child from the beginning probably will influence them one way or another for the rest of their lives. (Side note: if books like French Women Don't Get Fat and Bringing Up Bebe are any indicator, it would seem like the French just have everything figured out!) Here were the rules presented in the book- I'd love to know your thoughts! 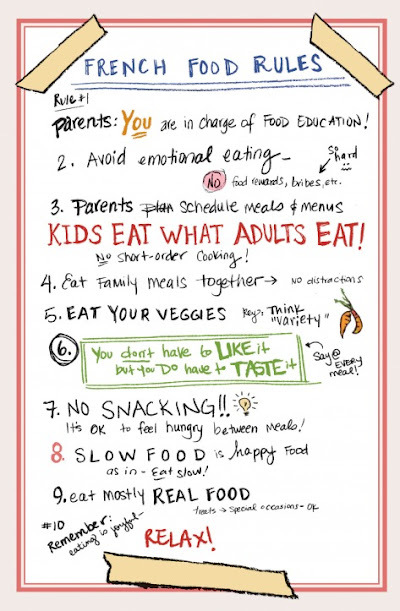 How do you introduce new foods and mealtime to your little one? We need to do that again very soon! I love that little guy and I loved spending time with you, V! Can't wait to plan a girls night soon!! Hi! Coming to you from the Naptime Review Blog Hop. Love your rules post here. 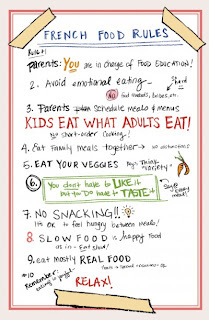 I completely agree... it is tough to let your kids make their choice not to eat. But my little boy gets to eat what is for dinner. End of story. So far it has worked, he is a pretty good eater. BTW- love the blog name. It's amazing when they sleep more! I'm so used to sleeping through the night now (my boy is 22-months) that I can't imagine the hit my body's going to take when I have a 2nd baby. Which is in the future. Anyways, yes, the French do seem to have it all together, don't they? I read a piece on that book over at a Cup of Jo, which I see from your fav blog list, you prolly read too. I think that introducing all types of food is a good point the book made. French kids aren't just limited to eating mush and junk food (I am always appalled at kid's menus b/c they don't just eat pizza and chicken nuggets!). They eat what the adults eat. I also love that the French make mealtime an event with table cloths and everything. We now eat meals as a family -- even if that means our kid sits in the high chair with a toy and hasn't touched his food. So...don't be too apprehensive about it. Don't let it stress you out. Follow your instincts. Don't be afraid to let baby reject food. I've read that it can take baby 7 to 11 times trying a food before actually swallowing/liking it. That's ok. Good luck! Miles is adorable. PS I wouldn't put a link to your comment form in your post because RSS readers, like me, won't be hitting your page first. And isn't it nice to have more pageviews? Just a thought! @ Lisa: Thank you for your comments! I love your advice! The reason I've been doing "Leave a comment here!" was my previous blog layout didn't have a way to leave a comment from the main page and some readers were having a hard time finding a way to comment! But now that my new design is finally complete I don't need to do that anymore. Thank you for your feedback, though- I really appreciate that!